Mobility in Lower Back, Hips & Shoulders: Specialist pre-natal yoga teacher - Ana Davis combines fitness and strength in this routine that focuses on increasing your mobility in your lower back, hips and shoulders. Classes and home practice are interdependent. The former provides the knowledge, the latter provides the experience. Each supports the other. Establishing an adequate balance between the two is the key to achieving a fulfilling relationship with your yoga. 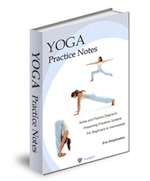 Enjoy notes and posture diagrams showing a variety of sequences designed for Beginners, progressing through to Intermediate, from experienced yoga teacher Eve Grzybowski. This flowing vinyasa hatha class - the final in a six class set - focuses on improving your strength, stability and balance whilst opening the hips. Created by Sydney yoga teacher Danielle Dolev to either refine your yoga practice (for intermediate level yogis) or improve their practice (for advanced beginners). Back-Strengthening & Spinal Extension: Specialist pre-natal yoga teacher - Ana Davis creates a class that strengthens and opens your upper back, extends your spinal, and increases your arm strength. Try this supportive routine by experienced teacher - Ana Davis - it works to soften and release tension in the abdominal area which can ease the discomfort of menstrual cramps.